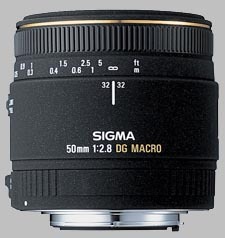 (From Sigma lens literature) The advent of digital SLRs requires optimum lens performance and therefore the very latest optical technology has been incorporated in the production of the new Macro 50mm f/2.8 EX DG. This ideal standard lens sets the benchmark for digital SLR cameras. The new advanced lens design corrects various aberrations. This macro lens is specially coated to get the best color balance while cutting down ghost caused by reflections from the digital image sensor. This lens provides the utmost correction against lateral chromatic aberration which is a serious problem for digital SLR cameras. A Floating Focusing system that enables this lens to photograph objects precisely in entire focusing range. This lens has a minimum aperture of f/45 (for Sigma, Canon and Konica Minolta mounts) or f/32 (for Nikon and Pentax mounts) provides greater depth of field. A focal length of 50mm used to be considered a "normal" lens in the days of 35mm film; that is, a lens that was neither telephoto nor wide angle. In the digital era, except on the relatively few full-frame cameras on the market, these are now short-tele lenses, but as such are great for portrait work or simply to give you a bit more working distance from your subject. The Sigma 50mm f/2.8 that's the subject of this review is also a true macro lens, capable of focusing down to a 1:1 subject/image ratio (that is, the image it casts on the sensor has the same physical dimensions as the original subject). It's one of the very few 50mm macro lenses on the market but, as we'll see, also works quite nicely at more normal subject/camera shooting distances as well. This lens is one of 6 different 50mm lenses that we did a shootout with. Senior tech Jim Tanner wrote up the test results for each lens on a comparative basis, with charts and graphs showing how each lens did compared to the others in the test. The graphs for this don't fit our usual layout well, so we've assembled the resulting "Tanner Report" into a full page that opens in a separate window. This will let you see Jim's charts in all their glory, yet still be able to access all our normal test charts, back on the main page. Read the Sigma 50mm f/2.8 Tanner Report for the full scoop! On our full-frame Canon EOS-5D test body, the Sigma 50mm f/2.8 held up remarkably well. Corner to corner sharpness was excellent, even wide open. (As you'll see if you check out their full-frame blur plots, a lot of 50mm lenses we've tested have struggled with corner sharpness on the 5D body.) Chromatic aberration was also helped by the 5D's larger pixels, the lens turning in very low CA numbers across the board. Where results do suffer is in the areas of shading (aka vignetting) and distortion. On the full-frame body, light falloff in the corners of the frame increased quite a bit relative to performance on the sub-frame 20D body, hitting a maximum of 0.7 EV at f/2.8, dropping to 0.4 EV at f/4, and settling in to between 0.2-0.3 EV across the rest of the aperture range. This behavior is a little unusual, in that we normally see shading decrease to very low levels as a lens is stopped down, but the Sigma 50's shading never got better than 0.22 EV. That's not much light falloff, and many users wouldn't even notice it, but we mention it because it seems a little unusual. Distortion also increased somewhat on the 5D, and interestingly, switched from almost imperceptible barrel distortion to moderate pincushion, with a reading of 0.18% pincushion. That probably isn't enough to bother most shooters, but those doing architectural photography are likely to notice it. (Committed architectural photographers are also likely to be well-familiar with the use of Photoshop or other software tools to remove distortion though, and the amount involved here is relatively slight. Bottom line this is an excellent lens for photographers with full-frame cameras, delivering images that are very crisp across the entire frame, low chromatic aberration, and fairly low distortion as well. - All at a very affordable price for the level of optical quality offered. Particularly in light of its "normal" focal length, this is a lens that deserves to be in every full-frame shooter's bag! Excellent image quality, EX build, true macro lens, not expensive. The only minus is slow and noisy motor. As a macro lens that works on my full frame Sony a900, this is a good lens at a good price. Just be aware that the focus motor is quite loud (I was trying to use it in a public library) and as noted in the review, there is quite a bit of CA. I own the older and better version (in construccion - a lot of metal), the Sigma Ex 50mm 2.8. The price is very nice and as well its sharp and very contrasty, good colours and bokeh - no weakness at all... And the portraits - nice job... who needs a 50mm - prime? For macro-beginners the best lens - highly recommended! I also own the Sigma 150 Macro (which is excellent). Image quality wise, this one is as good, if not a tiny bit sharper. It is small and light, so I always have it in my bag, even if I dont plan to do macro. I bought it also a as a walk around prime that can do macro if needed. The only down side is that the 150's HSM is much quicker, but I knew it wasn't HSM, and the AF is very accurate. The only canon alternative is the EF-S 60mm, which is very good and has USM, on the other hand I plan to go to full frame at some point, so this one was better choice for me. This is an excellent lens. Very high resolution from F:2,8 even at borders .Distortions are extremely low ( no visible ).Vignetting is very low too. Chromatic aberrations are very low. The bokeh could be better. The Construction quality is very good. AF speed is OK.
sharp, sharp, sharp. 1:1 macro. Solidly constructed and well worth every $. Autofocus is practically useless when shooting macro so be ready to focus manually (which is probably what you'll want to be doing anyway). Perfect for product or still life macros, but may not be close enough for bugs and the like. I used this lens on a D70. * Front element extends quite far, working distance from closest focusing point to front element is about 4cm. Very good for macro shots of objects that don't run away. Good for portraits too. Unusable for shooting insects.